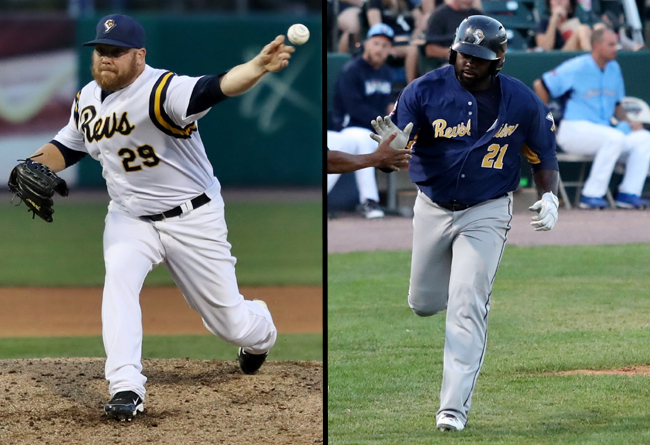 (York, Pa., Feb. 14, 2017) - The York Revolution have announced three more signings for the 2017 season, bringing back left-handed starter Frank Gailey and lefty slugger Michael Burgess, while adding reliever Joe Van Meter. The signings were announced Monday evening by Revs manager Mark Mason on “Revs Hot Stove Weekly presented by Shipley Energy” on SportsRadio 1350 WOYK. Gailey returns for his third season in York and will be with the team at the outset for the first time. The southpaw originally signed with York in June of 2015, going 5-3 with a 3.21 ERA during his first season with the Revolution, also his first year as a regular starter. Last year, Gailey joined the team in mid-May and became the ace of the staff, going 6-5 with a 3.14 ERA. A career reliever prior to his time in York, the Philadelphia native was originally drafted by the Toronto Blue Jays in 2007 and also pitched in the Philadelphia Phillies and Oakland Athletics organizations. The 31-year-old enters his 11th pro season with a 42-29 lifetime record and a 2.90 ERA. Burgess heads into his second season with York after batting .275 with eight home runs and 31 RBI in just 43 games last season, sandwiching a stint in Mexico. Burgess burst onto the scene with eight RBI in his first three home games with York, including a grand slam to start a club record-tying seven-run comeback on May 25 vs. Southern Maryland, the biggest comeback in PeoplesBank Park history. The 2017 season will be his third in the Atlantic League, as the Tampa native originally signed with Somerset, where he belted 15 home runs in 2015, helping lead the Patriots to a league championship. Drafted 49th overall out of high school by the Washington Nationals in 2007, Burgess has reached the Double-A level with the Nationals, Cubs, Astros, and Orioles organizations, and owns 155 home runs and 609 RBI in his pro career. Van Meter signs with York after making his Atlantic League debut late last season, appearing in nine games with Southern Maryland. Originally a 21st round draft pick of the Texas Rangers out of Virginia Commonwealth University in 2010, the 28-year-old right-hander spent his first four seasons in the Rangers farm system, having also pitched in the Tampa Bay Rays and Baltimore Orioles organizations, reaching the Double-A level. Van Meter owns a 4.11 career ERA in 164 appearances, including 44 starts. The Revs now have six players signed for the upcoming season and will continue to unveil preseason signings live each week on “Revs Hot Stove Weekly presented by Shipley Energy”, with the next episode set to air on Wednesday, February 22nd at 6:30 p.m. immediately following “The Baltimore Baseball Show” on SportsRadio 1350 WOYK.